Mango cultivation in India is a good long-term agribusiness. 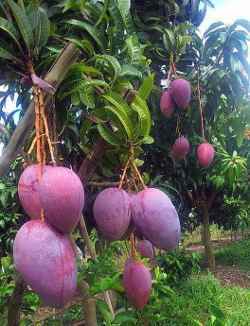 If you want to start a mango farm and make it profitable then you must learn how to plant mango tree and take care of it. Here is the complete mango tree information and plantation guide. It is always a pleasure to see ripe, yellow, aromatic mangoes heaped in the market amid the sweltering heat. The sweet mangoes down the parched throats feel refreshing and cooling. Mango cultivation is a bankable project because it may take 5-8 years to start bearing fruits but would do so for the next few centuries or till the tree is cut- whichever is earlier. Mango, or Mangifera indica is a tree native to India. 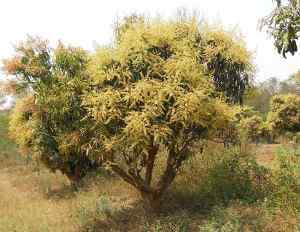 It grows from seeds and the trees can grow upto 10-40 meters in height. Mango trees are evergreen with rounded canopy. The roots are long and unbranched and measure upto 8 meter in length. The leaves have a set of interesting features to notice. Color of young leaves vary between varieties. They are generally tan-red, yellowish brown or pink in color when young. They undergo a series of different shades as they grow and finally are dark green when mature. The fruits are fleshy, fibrous, and have a characteristic ‘beak’ which is a small conical projection- special feature of mangoes. The prominence of the projection varies between varieties. Mango is a subtropical fruit and grows at 600 meter above sea level. The two factors that play the most important role in mango cultivation are climate and soil. These two dominate the quality of mango fruits and the future of a mango farm. Although mangoes can grow in a wide variety of climates, it can grow best in tropical and subtropical climatic conditions. They need a good amount of rain during their growth period and a dry spell during the flowering period. In other words, it needs a good amount of rainfall from June to October and dry spell from November. Rainfall, high level of humidity or frost during flowering period may hinder the flower formation process. Usually, the timing for planting mango seeds vary although it depends on the amount of rainfall the particular area receives. They are planted at the end of the rainy season in places where there is ample rainfall. Planting is done during the months of February and March in irrigated areas. Lastly, in rain-fed area, the planting is done in July- August period. Mangoes grow well in all types of soils. However, the primary soil requirement is that they must be well-drained and deep. 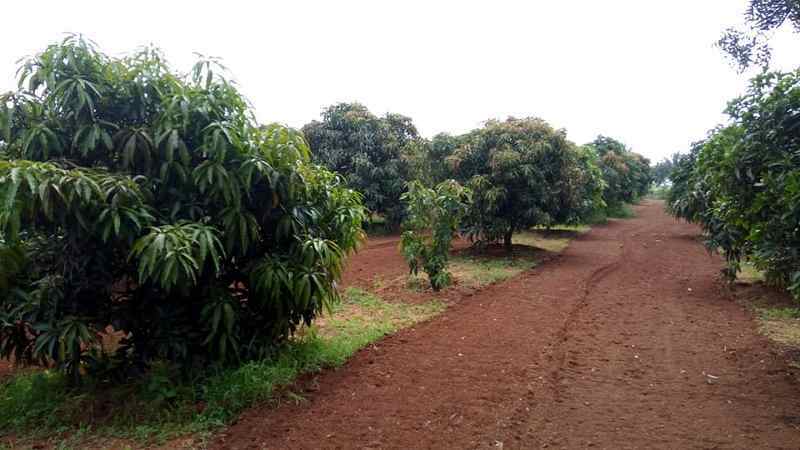 Red, loamy soil is the most ideal for mango cultivation. However, in India, they can grow in alluvial, clayey or laterite soil. The soil must have rich organic content and must have a good water retaining capacity. Soils that do not have good draining facility are not ideal for mango plantation. They grow on plains rather than hills. Cultivation in hilly areas can lead to very low yields as the drainage and climatic conditions are not best suited for mango cultivation. 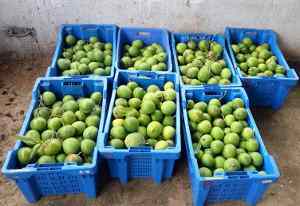 Soils with good amount of iron peroxide and 5-10% lime are ideal for producing the best quality mango fruits. Fruits produced in such soil conditions have a bright red tinge. Mangoes cannot tolerate alkalinity while it can grow in light acidic soil. Hence, a pH between 4.5 and 7.0 is preferred for mango cultivation. The soil is sometimes mixed with peat moss a year before mango tree plantation to improve the acidity of the soils. The irrigation requirement of mango plant depends on the climate and soil of the area of cultivation. Soil with good water retention capacity needs lesser irrigation while clayey soils need no irrigation at all. Mango saplings need frequent watering till they establish themselves properly. This also helps promote vigorous plant growth. Once established which is after a period of 6 months, they are irrigated once in every 10-15 days. It must be increased in case of soil with good drainage capacity. Irrigation should also be followed during winter to avoid the saplings from getting affected by frost. It is generally stopped 2-3 months before flowering because it might promote vegetative growth during the flowering period indirectly affecting the yield of the fruits. Mango farm follows intercropping system in which short-duration crops like vegetables, legumes, groundnut etc. are grown. This is typically one during the pre-bearing age. Fruits and vegetable crops local to the area of cultivation are generally grown. Some farmers also practice apiculture or beekeeping in mango orchards. Mangoes can be grown from seed or propagated by the vegetative method using various grafting technique. This is perhaps the easiest method of mango planting. The seeds or mango stones are collected from the market places, local trees and sometimes even at domestic level during mango season. They are then sown in nursery beds specially raised for this purpose (1 X 5 meter). This sowing is done in July. The seeds germinate after 20 days of sowing. The leaves are initially coppery red. When their color changes to green, the seedlings are transplanted to the permanent beds. Mangoes raised from seeds are inferior in quality when they hit the market. Therefore, asexual methods of propagation such as layering, grafting, cutting, etc. are practiced. This ensures better fruit yield and higher quality of mangoes that have a good market value. In addition, they are also suitable for export. Develops black spots during rainy season. Suvarnarekha Sundari, Lal Sundari and Chinna Suvernarekha. The fields are ploughed to remove the crop debris, weeds and rocks. The heavy clods are broken down to loose soil. This step is important to provide good tilth for the healthy development of the younger roots. The land is then levelled with adequate sloping. The slopes are necessary to facilitate the drainage of excess water and in irrigation. In case of soils that do not let water drain off quickly, trenches are made to prevent water from being stagnated. After preparing the field, the orchard layout is designed. This is an important step which must be decided as per the needs of the orchard. There are different systems of field layout such as square, contour, rectangle, hexagonal and quincunx. Pre-grown nursery mango saplings are transplanted into the fields once their leaves turn green in color. An intercrop distance of 8 meters is maintained as the saplings need space to grow and become trees. Generally about 60 mango saplings can be planted in one acre of orchard area. But, this number differs in ultra-high density mango tree plantation where the distance between mango trees are very short. Plant the graft at the center of the pit along with soil. The grafts used for plantation must be a year old and obtained from certified centers. The dosage applied in the first year should be increased in multiples of the dose every year for the next ten years. Generally, fertilizers are applied in two doses. One half is applied immediately after harvesting the fruits- during the months of June and July. The other half is applied in October. This is done for both old trees and young saplings. Irrigation follows if there are no rains. Before flowering 3% urea is applied in case of sandy soils. Black, round spots develop on the fruit. The disease affects young leaves, stem, inflorescence and fruits. The ripening fruits show typical anthracnose. Black spots appearing on skin of the affected fruits gradually become sunken and coalesce. Sprays with fungicides such as Burgundy mixture, Bordeaux mixture, etc. The disease appears in the form of whitish or greyish powdery areas on tender foliage and inflorescence. The disease may be controlled by spraying 5-5-50 Bordeaux mixture, cosan, karathane WD and benomyl. Although dusting sulphur at 10-15 days interval is effective. Selecting scion from healthy trees and exposure to sunlight has been found to be effective control measures. The leaves of affected tree appear sparse and lustreless. Diseased tree wilts and dies. Infected roots are very light in weight and get easily crumbled and powdered with fingers. The fruiting bodies of the fungus (brackets) appear at the base of the tree in rainy season. Collection of brackets and destroying them is effective. Also exposing the roots and drenching them with dinocap 2ml/litre effectively reduce disease. Black colored molds develop on the leaves, flowers and fruit surface. This progress to form a thin film of black color. The fungal growth can be checked by spraying with 0.2 per cent wettable sulphur. Yellowish, pin-head-like spots appear on leaves and twigs which gradually enlarge. The disease can be easily recognized by the rusty-red spots mainly on leaves and sometimes on petioles and young twigs. The spots are at first greenish-grey in colour and velvety in texture. The roughly circular and slightly elevated spots sometimes coalesce to form a larger, irregular spot. The upper surface of the spot consists of numerous, unbranched filaments which project through the cuticle. Some of the filaments represent sterile hairs while others the fertile ones. The latter bear cluster of spores at the apes. Cells of both the types of hairs and mature spores are brown-coloured. After shedding of spores and hairs, a creamy white mark of the algae remains at the original rust spot. Spraying bordeaux mixture controls the infection. Development of a small, etiolated area at the distal end of the fruit that spreads and covers the tip is the first symptom. The spots enlarge, turn dark brown and coalesce into a continuous necrotic area. Tissues decay and necrotic portion collapses. The disease can be reduced by one to two sprayings with borax (2.7-3.6 kg per 100 gal water). Mango trees start bearing fruits from the 5th year of planting. The yield however varies depending on the variety and climatic conditions. The first year yields are generally low (3-5 Kg per tree) increasing gradually in subsequent years. Some trees at the age of 30-40 years can bear upto 600 Kg of fruits a year. Since mangoes continue to ripe even after they are plucked from the trees, they are commonly harvested at the premature stage. This is done to capture them early in the market. The plucked fruits are graded based on their color, size and stage of maturity. The smaller ones are separated from larger ones so as to attain uniform ripening. Fruits that are diseased, damaged or overripe are discarded at this stage. Ripening of the fruits is done by dipping them in 1.8 mL of ethrel in one litre hot water for 5 minutes. In case of mature fruits, lower dose of ethrel dipping is done for uniform color formation. The mature fruits are stored for 4-10 days at room temperature. However, this depends on the variety. The fruits are generally packed in bamboo baskets, wooden crates or cardboard boxes of rectangular shape. Normally one box can accommodate about 5-6 Kg of fruits. They are then transported to different places via road. Mango cultivation is a long term investment unlike many other crops. However, following the practice of ‘intercropping’ by planting turmeric, groundnut, various legumes and apiculture would generate income for the farmer till returns form the fruits can be generated.